Every day I feel like I am surrounded by the intrusion of unwanted chemicals. They are in the air, the water supply and they certainly permeate most of today's foods. Those who care about their health try to stay one step ahead of this enslaught by being informed and by making adjustments. Hand wipes and purification liquids are found in most grocery stores and large bins of organic produce, free-range eggs and meat sans preservatives or other additives are more than a flavor-of-the day business - they are a big business. I no longer eat processed meats unless they are nitrate, nitrite-free, hormone free and perservative free. Trader Joe's carries a variety of this chemical-free sausage and I love the Sweet Italian Style Chicken Sausage. It is delicious! 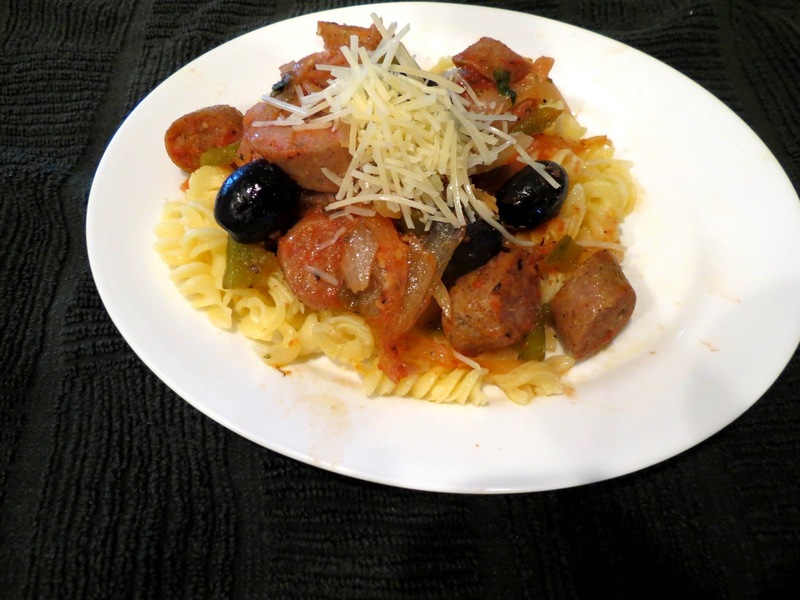 *(The recipe, Diane's Black-olive and Sausage Pasta (G), features gluten-free pasta). Cook desired amount of pasta according to package directions. Drain, put hot pasta spirals in a bowl. Add enough olive oil to coat the pasta evenly, but lightly. Set aside and keep warm. Slice sausage into pieces. Heat 1-2 Tbsp olive oil in a pan, med-high heat. Add sliced sausage and saute until meat is evenly browned. Cut sweet onion into wedges and slice the wedges thinly. Slice pepper and combine with the onion. Add this mixture to the browned sausage. Saute until onion is slightly transluscent. Do NOT burn. Turn heat down and add enough tomato sauce to evenly coat the meat mixture - this is a hint of flavor not a tomato sauce bath! Season to taste and add whole black olives. Toss gently to heat through. Divide pasta onto each serving plate and spoon a portion of sausage mixture on top of sprirals. Sprinkle with freshly grated Parmesan cheese. Serve.